While Serena dances in the New Year in Buenos Aires, Jenny has decided to head back to high school, Dan is still... well, Dan, and Chuck Bass is totally MIA. Bart's brother, Jack Bass, is all over the world looking for him. Rufus has been gone for two weeks, and greets Dan with a cover story that he's been looking for a painter. Dorota and Blair are busy with Blair's next scheme: hosting a party for the Colony Club, an exclusive Upper East Side women's group. Eric and Jenny see Nelly on the steps, where Penelope and her posse show up and threaten to punish Nelly for not bringing them Starbucks. Nelly tells J she can't defect from the group because they'd make her life hell, and runs off to do the girls' bidding. Blair and Dorota meet Jack at his limo. Turns out he found Chuck in Bangkok. Jack drags C out in a near-unconscious state and drags him inside. Rufus drops Dan off at school. It turns out he was in Boston for the last two weeks looking for his love child - with no luck. If he wants to know where the kid is, he'll have to talk to Lily, he's been told. Serena and Dan meet in the hallway, and S tells him that she broke up with Aaron three hours into their 15-hour flight to Argentina. She doesn't even really get into why - but we all know, come on. It's Aaron Rose! In any case, Lily sent Serena an email saying that she and Rufus will never be together, so Serena decided she wanted to be with Dan. Dan enthusiastically agrees and they kiss a lot in school, much to the dismay of Blair, who's feeling bad enough as it is. Lily goes to the gallery to see Rufus, who demands to know where his child is. Lily lets it slip that it's a boy, but little else. Rufus resolves to find him without Lily’s help when she refuses. Jenny and Eric watch as Penelope forces Nelly to buff her shoe. J steps in and asks them to back off, but Penelope doesn’t back down. J and E steal Nelly away before P makes her lick the shoe, but the feud is on. Chuck shows up to school having missed all his classes, and Blair finds him smoking a joint in the middle of the hall, completely out of it. The head mistress shows up before Blair can get anything out of Chuck. Serena and Dan are kissing in Brooklyn when Rufus walks in and forces S to leave. Dan is not thrilled, and after Serena leaves, Rufus tells Dan that dating her again is a mistake. Dan is even less pleased now. Blair pleads Chuck's case to the head mistress, as he’s in no state to do so himself. Uncle Jack shows up to help out as well. B defends C, saying he’s been through an ordeal and is not in his right mind. The head mistress asks Chuck to promise that it will never happen again. He replies by taking out another joint and walking out. The next morning, Dan and his dad aren’t speaking. Jenny is confused by the silence, but can’t get any info out of either of them. Dismayed, Blair tells Serena that when she looked in Chuck's eyes, she couldn’t even see Chuck anymore. Deciding to raise the stakes, Eric, Jenny and Nelly sit at Penelope’s table. When the posse shows up, they are not too pleased. Penelope's next move is to call her daddy and tattle that there’s a girl bullying her. Chuck is sandwiched between two girls at Victrola, which he bought back for a high price upon returning to New York. C says he’s hosting a party at the club tonight. B begs him to stop the madness. Dan comes home to look for evidence of whatever Rufus is keeping from him. He finds a map of Boston with adoption agencies marked. Dan calls a number and hears "South Boston Adoption Agency" on the other line. Blair comes home to her get-together with the Colony Club, who she decides she hates when they bash the company she keeps, i.e., Lily, Serena and Chuck, to her face. Way to go, Blair. Reeling from Penelope's offensive, Nelly spills to Jenny that Penelope is sleeping with her lawyer dad’s junior partner. Time for blackmail! Dan confronts Rufus about the map, but Rufus brushes him off, and Dan storms out to find Chuck, whom he knows has the truth about this big secret. Chuck tells him, after a little cajoling, that he is not the first-born Humphrey. Outside, Jenny’s gotten Nelly to spill the beans about Hazel and Isabel, and threatens to send it all to Gossip Girl if they don’t let go of Nelly. Penelope relinquishes her throne to Jenny, who now finds out she’s just won "queen." Jenny doesn’t want that, though, so P takes it back — with Nelly. Turns out Nelly was just riding Jenny’s coat tails, hoping for a new master. When Nelly realizes Penelope is her only key to attending the upcoming collegiate party, she rushes back to lowly servitude. Ah, high school. Lily finds Rufus. He tells Lily that he wants to hate her, but doesn’t, and promises that her kids won’t either. Lily says giving up her son has been a hole in her life, and agrees to help Rufus find him. Blair runs to the club and runs into Jack. They rush up to the roof, where they find drunk Chuck, leaning over the ledge, looking ready to jump. She convinces him to come down, if not for himself, then for her. Chuck takes her hand and gets off the ledge. They embrace, and he apologizes. Rufus calls Dan and asks him not to tell Serena about their long lost son, whom they are going to look for right now. It’s Lily’s secret to tell. Dan agrees, though he was about to tell her himself, despite Chuck's warnings that it would probably be too much for their relationship to sustain. Jack piles Chuck into the limo, saying he’ll have a better chance of keeping him around than anyone else. “He can’t know what happened on New Years,” Blair says to Jack cryptically as they leave. Lily and Rufus get into a car, off to search for their son. What did you think? Discuss in our Gossip Girl forum! Jenny: Okay no. That's not okay. Jenny: They treat her like their servant. Eric: And it is none of your business. It's a new year, remember? A new Jenny Humphrey? 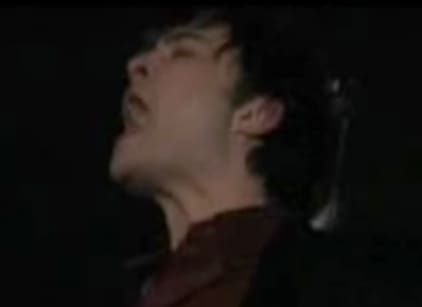 Gossip Girl Round Table: "In the Realm of the Basses"